There are a variety of ebook readers available in the market and they use a variety of input formats including but not limited to cbz, cbr, cbc, chm, djvu, docx, epub, fb2, html, htmlz, lit, lrf, mobi, odt, pdf, prc, pdb, pml, rb, rtf, snb, tcr, txt, txtz. While PDF is the most popular format and is supported across a large variety of devices, it is not always optimal to read all ebooks or documents in PDF format. Although PDF format has been made to look the same in all devices and screen, the problem is that the PDF format is primarily made for larger screens. And the native rendering of most of the ebook readers is different from each other. A PDF document will have the same margins, text size etc. and will not look optimal when seen on smaller screens. This is the case with almost all the formats. Some formats will not run on different devices while others will have their own limitations. Converting your ebooks to a different format of your choice is a challenge. 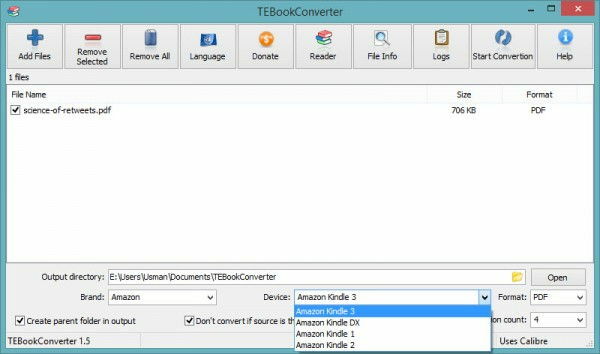 TEBookConverter is an installable as well as portable tool which can convert between more than 25 ebook formats. You can open a file for conversion or a folder or a complete folder tree. TEBookConverter will list down all the convertible ebooks from the folder tree you have selected. You can convert up to 16 books simultaneously. For me, the user interface of TEBookConverter was a little confusing. First you will need to select a file or folder from Add files button and then configure the options in the lower configuration pane which includes selection of output directory and other options. If you want to convert your ebook to read on a specific device, you may select the brand from Brand drop down menu and then select the device from the Device menu. The last selection is of format. You can choose only one output format from the listed ones. The output formats depend upon the brand and device drop down menu selections. Then you may select how many files to convert in parallel. You may select from 1 up to 16 files simultaneously. The Start Conversion button is found at the top menu. Clicking the Start Conversion button will start the conversion process which should not take much time depending upon the no. and size of ebooks. While converting my books a few times, I have encountered some errors which suggests that TEBookConverter is either not very much stable at the moment or it has compatibility issues with Windows 8.1 which is Microsoft’s latest Operating System. But overall, I have found it very useful and the actual resulting converted file is perfectly OK without any errors. Converting ebooks with TEBookConverter has been a lot of fun for me. What is your favorite utility to convert ebooks into different formats? and this seems to be very much like calibre? 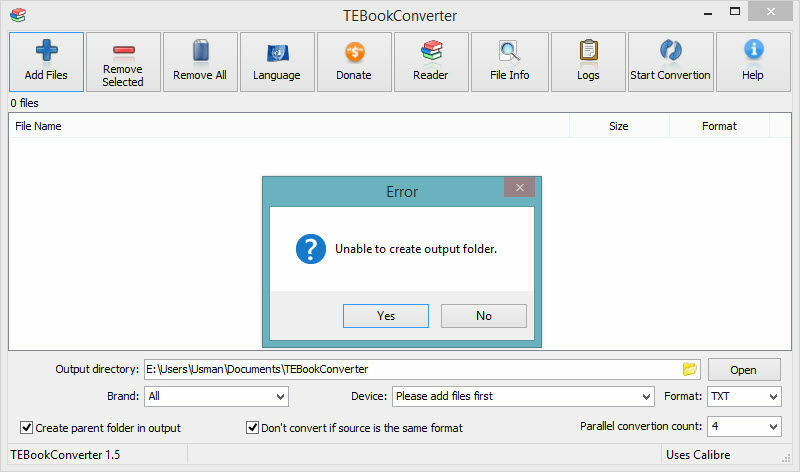 Calibre is also the tool to convert between multiple formats but I have found tebookconverter usage to be simpler. Your explanation of the whole process was also good otherwise it would have taken me some time to understand the steps involved for conversion. What if any ebook is DRM protected? If I change its format to another one, will it be legal or not?